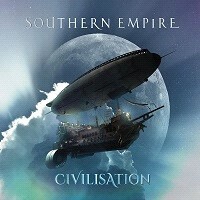 After releasing a well received eponymous debut album in 2016, "SOUTHERN EMPIRE" give it another shot with "Civilisation" : a four pieces album for a total of almost one hour of music. For those who don't know them yet, it started when Sean Timms back then playing for "UNITOPIA" decided to form another band after after his band split up. He then asked to be helped with strong musicians and then "SOUTHERN EMPIRE" was born. "Goliath’s Moon" (written by guitarist Cam Blokland) starts it all with such amazing production. The first thing i thought while loading the first notes was "Wow! what a great sound!" This song is uplifting and positive.Vocals are perfect, solo and harmonies. Very "Transatlantic" (the band). This is high level performing.You cannot move or have any reaction while listening to it. Great communicative, sincere music.I really like the vibe.Little passages made me think about DREAM THEATER ( passages without lyrics), Steven Wilson" too in the soft parts. Quite an excellent starter. All is well balanced. "Cries for the Lonely" is a nineteen minutes song, that represents the third of the album. We have inviting synths, great electronics background and the drumming is flawless. The guitar time signatures are quite complex and adds a lot of dynamics to the song. We are offered a major quality keyboard solo playing with great production skills to let the listener have a maximum pleasure of an experience.We got great piano before living an astounding expression of vocal harmonies and choirs. When i thought i got the maximum pleasure in my ears, violin is added to the song and i must say that's AMAZING.Use of the pan flute is memorable and quite played like masters do.Every space is used, even the air do music.The kind of song you should listen to many times to ear all the subtleties. The drums are overwhelming even while playing what seem smooth and easy. An excellent solo can be heard around minute twelve of the song and adds great flow to the track. We also can hear foreign children talking in a sample. This song talks of vulnerable children around the globe. Such an emotional subject. "I've seen many friends not making up through the pain, the place I live is a desert now, and I've been witness to the world have messed again…" says Lopresto reporting what too much child lives. Last minutes are filled with intense guitar play and drumming till it fades out. "The Crossroads" starts with some primal rhythm with indigenous like people singing. And then the synths and the entire instruments comes aboard. I'd like to mention that Queen seems a great influence for at least the theatrical aspect of this song. That apart, the guitars are very energetic and metal oriented in the chords progressions and all. We got an amusing but quite well played flute and kind of wood percussion solo having a major oriental spirit.I like the pan flute so much in that song.Its played like a charm. Ian Anderson would like these parts! "Lopresto"'s silky voice is quite welcome. Some choirs adds a lot of punch to the song .The use of the saxophone is majestic and teamed up with some killer bass lines makes this journey quite a special one and magical.Around minute thirteen we got some major drum greatness with the help of killer guitars and violin in the background. This song is AMAZING. Some beautiful acoustic flamenco-like gypsy guitar is offered around minute fifteen to act as a transition to another part of the part, starting with only bass and drums and such beautifully rendered keys. Even the use of trumpet can be heard around minute twenty four. This song is very versatile, well written, no flaws can be heard.Only perfect expression of the heart.I know one word now to describe the best "SOUTHERN EMPIRE": SINCERITY. "Innocence and fortune" is the last track of this majestic experience.We can hear a sample of a women asking for help. I'ts a song about liberty i guess and relieving the pain. The keyboard reminds me of THE WHO jerky playing. A great dose of piano is used and the transverse flute is once again wonderfully played. We got a great expressive solo around minute eight, and then piano and flute each one of them saying goodbye the greatest they can. SOUTHERN EMPIRE is a very inspired ,sincere, emotive, dynamic, band that won't get stuck in the progressive rock trap of playing too much and saying nothing. They deliver great rock and what makes it so amazing is that I believe in what they say. They don't have to over express themselves. This album is the product of a lot of work and it still flows like a charm.Australia's got a major progressive rock act and i wish them a great future! Release date is august 24th on "Giant Electric Pea"!